Our mobile visitor center, the Chesapeake Roving Ranger, is back on the road representing the Chesapeake Conservancy and National Park Service and serving up a bit of the Bay! This season, the Ranger has traveled throughout the watershed and took up shop at a dozen events and festivals. Visitors to the Roving Ranger can collect a National Park passport stamp, pick up special junior ranger program books related to the Chesapeake Bay watershed, and participate in an interpretive program. In addition to showcasing a number of fresh activities, the Ranger is sporting a new look! In early spring, the vehicle underwent a refit and now features a brand new popup window, solar panels, and additional graphics that include a brand new hands-on Bay watershed map. The Ranger is hard to miss, it’s the size of a delivery truck and features large, beautiful scenes of the Chesapeake Bay on all sides. October 26-28, Sultana Education Foundation’s Downrigging Festival, Chestertown, MD. For any questions or to schedule the Roving Ranger at your event, contact Kate Marks Hardy. 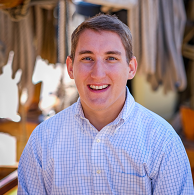 Patrick is the Communications and Partnership Assistant working with both the Chesapeake Conservancy and the National Park Service Chesapeake Bay Office. Previously, Patrick worked for Pride of Baltimore II and Schooner Woodwind. He is a graduate of Saint Michael’s College and holds a Bachelor of Arts in History. That’s a Wrap: Chesapeake Roving Ranger Season Comes to a Close!